I’ll be honest and say I had pretty low expectations when I decided to make sweet potato muffins. In terms of baking, sweet potatoes have always seemed to me like pumpkin’s stringy-haired, less charming step-sister. I have no evidence to back up this notion. Maybe it’s just that in this country, in all the months that end in -ber, pumpkin gets all the glory in baked goods, while sweet potatoes dutifully play side dish. Probably there’s a Pumpkin Baking Lobby at work beneath this phenomenon. These muffins come out with flavor as bright as their color. A hint of orange zest in the recipe adds just the right counterpoint to the heartier tubers’ taste. And despite the heft of sweet potatoes’ texture, these are light, moist, and even–dare I say–fluffy? With a dusting of cinnamon sugar on top, I’m kind of sad I only made about a dozen. So there you have it. I’m a sweet potato baking convert. Are you? Next time you have extra cooked sweet potatoes leftover, remember to try out this recipe, and I think you will be in no time! 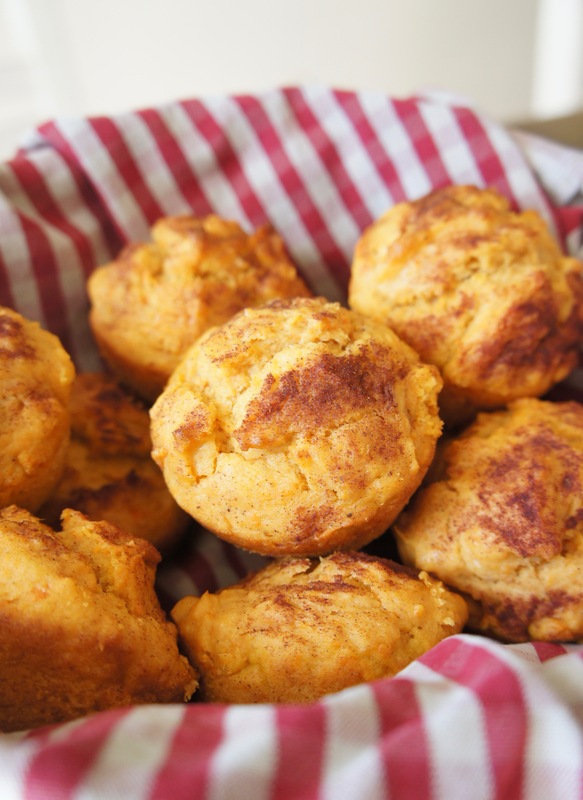 These Cinnamon Sweet Potato Muffins will make you a sweet potato baking convert! They're surprisingly light, not too sweet, and only 150 calories each. In a small bowl, combine 1 Tbsp. sugar and 1 tsp. cinnamon. Set aside. Preheat oven to 400 degrees. Grease 14 muffin cups with cooking spray. In a small bowl, combine whole wheat flour, all-purpose flour, salt, 1/2 tsp. cinnamon, nutmeg, and baking powder. In a large bowl, mix eggs, sugar, orange extract or zest, oil, and milk. Add the sweet potatoes and mix until thoroughly combined. Add dry ingredients to wet ingredients and mix. Spoon batter into prepared muffin cups. Sprinkle tops with cinnamon-sugar mixture. Bake 20-25 minutes or until the tops spring back when touched. Store in an airtight container. Sweet potato? I’m definitely going to have to try these as an alternative to pumpkin. My hubby is a big fan of sweet potaotes. What a great idea! I’ve never thought about putting cinnamon with corn bread, but of course it sounds perfect!